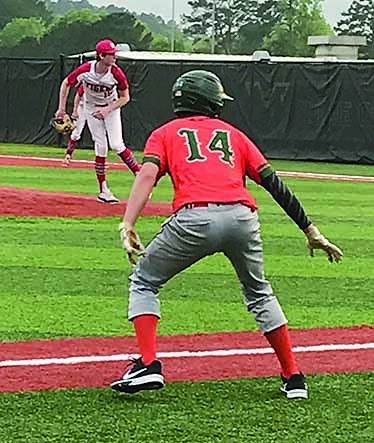 The Lakeview Gators travelled to Many Thursday, April 4 for their second game against the Tigers that week. After losing that Tuesday against Many, the Gators got their chance to redeem themselves. But, good teams are going to be good teams, and good teams are tough to beat. The Tigers were putting the ball in play and making their outs. Unless you do the same, your team is going to get beaten. Lakeview did not record a hit in the game. One positive though, the Gators were walked nine times, but weren’t able to capitalize with runners on base. #22 Isaac Coleman took the loss for the Gators. Coleman pitched four innings, allowing 11 runs on nine hits, along with two walks and two K’s. Coleman’s record this season is now 0-2. Eighth grader Isaac Coleman on the mound for the Gators. With more district play ahead for the Gators maybe they can turn it around and make a push for the playoffs. We are all hoping that they do.